Report of a 4-day research workshop on the history, present and future of a modernist campus belonging to one the oldest universities in the world. This workshop has been kindly supported by the Embassy of the Kingdom of The Netherlands. The report is written by Abdelbaseer Mohammed, lecturer at the planning department of Al-Azhar University. 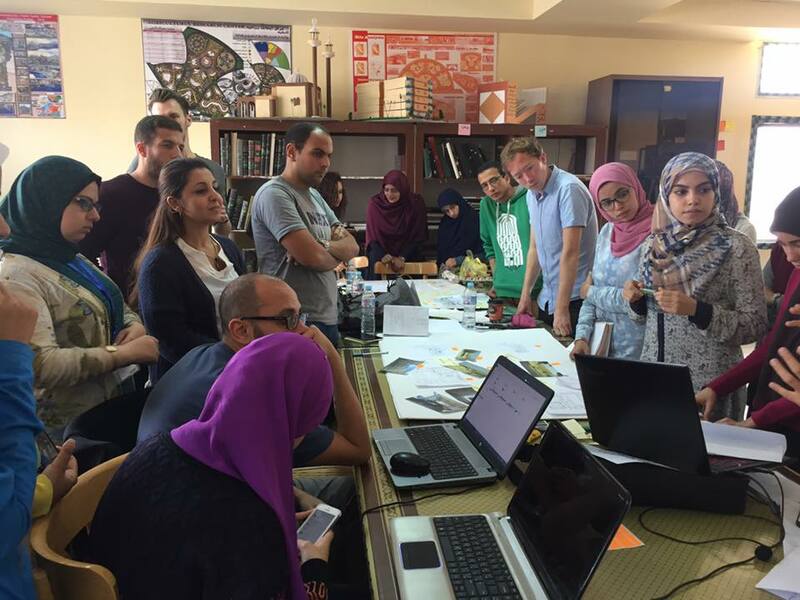 From 20 to 23 November 2016, Failed Architecture has organised a workshop on the Nasr City campus of Cairo’s Al-Azhar University, in collaboration with the university’s planning department. The workshop aimed to examine the social, political and economic conditions surrounding and influencing the development of the campus from before 1961 to the present, and into the future. Al-Azhar was established in 972, when the Fatimid Caliph, Mu’izz Li-Din Allah, ordered the general Jawhar Al-Siqilli to establish a new capital outside Cairo’s city limits with an impressive new mosque. For 900 years, Al-Azhar was a ‘mosque college’ and regarded as a central place for the study of the Islam. The formal designation of the mosque as a university with a more modern and secular identity took place in 1936. Today the Al-Azhar institution has branches worldwide and across Egypt, with a total of more than 90,000 students. The Nasr City campus was built in 1960s with separated zones for male and female students, and constitutes the largest section of the Muslim world’s oldest university. On 17 December 2010 the so-called Arab Spring began in Tunisia, soon spreading across the Arab world, toppling long-serving regimes. After a period of both violent as well as peaceful demonstrations, Egypt’s president Hosni Mubarak had to step down on the 11th of February 2011. At the time, calls were issued to reform Al-Azhar substantially and to free the university from its connection with the state. One year later Mohamed Morsi, who belongs to the Muslim Brotherhood, took office, but after a short reign and nearly four days of sustained mass demonstrations, he was removed from office by the Egyptian army. Pro-Morsi students at Al-Azhar University protested in response. After the political riot, the authorities started to put high concrete walls on the campus, encircling the university administration building, fencing off the arcades of Islamic buildings, cutting tall trees, and installing new gateways and checkpoints. Students complained that it made the campus unpleasant, as it considerably hampered mobility and social interaction. It can be argued that the security concerns related to urban protests imposed challenges to the campus’ livability. This situation raises questions on the future of the campus, and its relation to both the student population and the surrounding city. 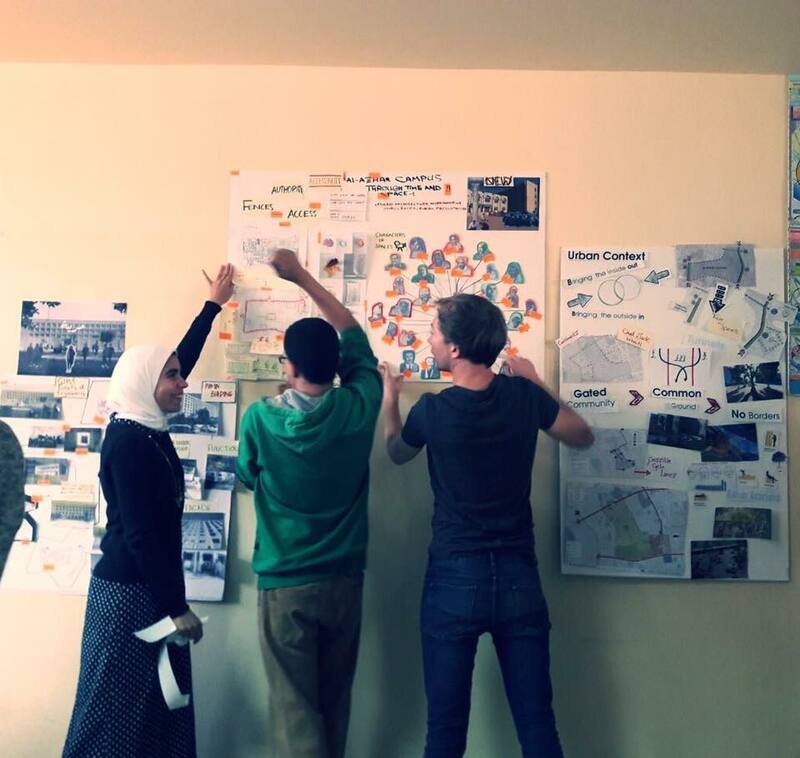 From the 20th to the 23rd of November 2016, Failed Architecture conducted a 4-day research workshop to investigate the various conditions that have influenced the urban transformations of Nasr City campus over the years. 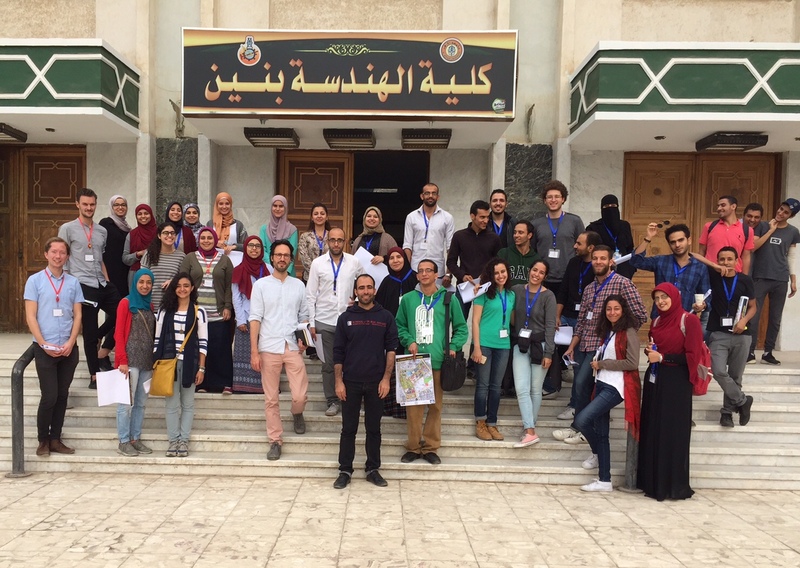 A group of 25 students and young professionals from across Egypt participated and researched the campus using Failed Architecture methodologies. By using archives, books and scientific papers, conducting extensive field observations and interviews, and attending a series of talks on various related subjects, the participants constructed a collective overview of the past, present and future of the campus. On the first morning of the workshop, the FA team introduced their work and their objectives, and explained their methodology with a wide range of examples from around the globe. Participants have been divided into five groups covering five axes of analysis: History, Architecture, Public Space, Urban Planning and References. In the afternoon, Professor Nabil El-Hady, Professor of Architecture at Cairo University, gave a lecture entitled “Architecture of (no) Questions. On Egyptian campuses”. He discussed the architectural style to which the university buildings relate, and examined the influence of such buildings on the physical environment of the campus in terms of academic freedom. According to him, the architecture of Egyptian universities and the socio-political and economic context shouldn’t be treated as separate. He also reflected on Al-Azhar’s Nasr City campus and showed that its buildings sported aesthetics related to the late President Gamal Abdel-Nasser’s pro-Soviet socialist and nationalist ideology. Professor El-Hady showed that the campus first master plan had a mosque that was never built. With this in mind, El-Hady questioned the real intent of establishing a whole new campus far from the old campus and the prestigious Al-Azhar mosque, whether it is to revitalise and modernise Al-Azhar or just a way to deconstruct its religious background. 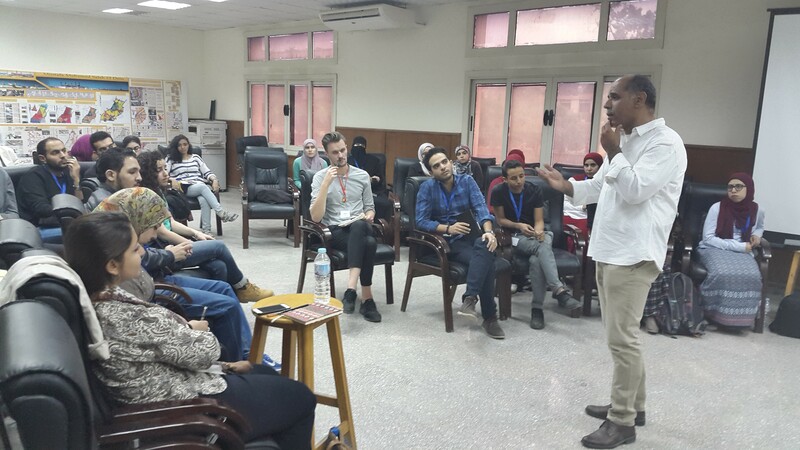 The day ended with a tour of Al-Azhar’s Nasr City campus guided by Abdelbaseer Mohamed, who explained the university’s urban composition and discussed its history. He stated that the campus has a coarse-grain structure that was developed in a discontinuous and fragmented way with only about 15% of the area allocated for the “College for Girls”. He also reflected on the campus landscape and showed in detail the new constructions since the 2013 riots. He explained that the the predominance of larger gated blocks discourages walking and that the university campus itself is made up of large clusters that foster car use. In the morning of the second day, the participants worked in groups. They started to fill up the timeline with information available at archives, academic articles, and online sources. Then, the campus was further examined through interviews with students, recording human activities, and taking photos from the top of the buildings. 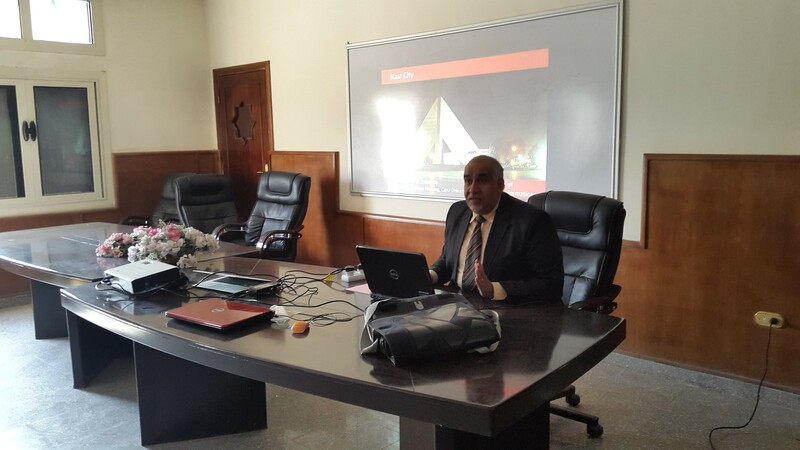 Subsequently, Professor Abbas El-Zafarany, dean of the Faculty of Urban and Regional Planning at Cairo University, gave a lecture entitled “Nasr city: transforming a new city to a city center”. He discussed the history and planning of ‘Nasr City’, the neighborhood surrounding the campus, and the ideology upon which it was built. He explained how Nasr City transformed over time from a newly constructed administrative center into a central neighborhood, where in more recent time a sudden expansion of the upscale shopping malls has taken place. When asked about the social impact of this transformation, Professor El-Zafarny responded stating that the area was originally planned to reflect socialist ideals, but nowadays one can find upscale venues such as expensive shopping malls that target the upper-middle class. The second day ended with a tour of Al-Azhar’s old campus in historic Cairo guided by Abdelbaseer Mohamed, who presented background information about Al-Azhar mosque and the Religious Sciences and Arabic Language buildings. Workshop participants were intrigued by a photo of an Islamic scholar teaching a ring of men and women at Al-Azhar Mosque without any physical barriers. Generally speaking, spaces of the old campus were seen as open, interactive and inclusive. The morning lecture of the third day was given by Dr. Shaimaa Ashour, a lecturer at The Arab Academy for Science, Technology & Maritime Transport. She reflected on architecture in Egypt starting from the 1920s until the middle of the twentieth century. She stated that European and ‘half-Egyptian’ architects worked for royalty and wealthy clients, and dominated the profession of architecture in Egypt during that period. In response, a nationalist trend started in the second half of the twentieth century with the aim of producing inclusive architecture that reflects Egyptian society in a better way. In the afternoon, the participants intensified their research and continued the process of creating the overview boards. 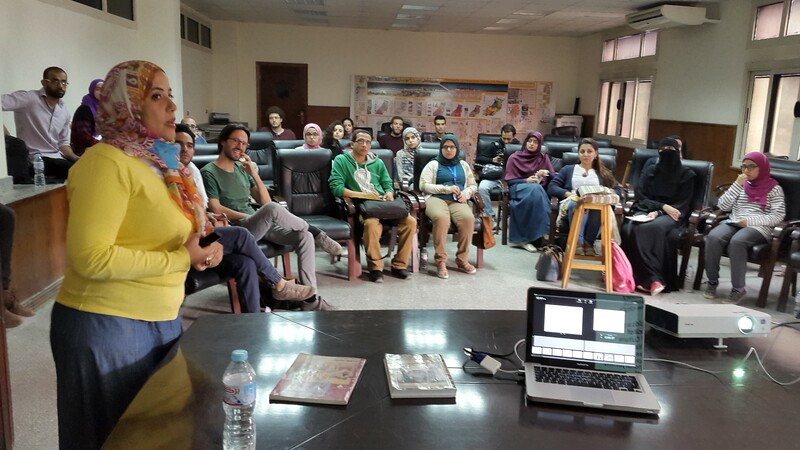 The history group provided a thorough overview of the Republic’s leaders, university chairs, key graduates and events influencing Al-Azhar’s Nasr City campus from before 1961 to present, while the architecture group has focused on studying the recently opened girls’ Faculty of Engineering. The public space group was concerned with studying greenery, street furniture, and walls with relation to accessibility. In addition, the reference group compared Nasr City modern campus with the old one, in central Cairo, in terms of accessibility, space typologies and ideologies. Finally, the urban planning group has focused on studying the relationship between the campus and the surrounding context in terms of accessibility and constraints. The day ended by a tour of Ain Shams University’s modernist campus guided by Dr. Mohamed El-Fiomy, associate professor of Urban Planning at Ain Shams University. He reflected on the redevelopment of faculty of Engineering campus. He stressed that the new development plan aimed at socializing outdoor spaces. With the creation of more pedestrian networks and discouraging car use the campus became more hospitable and more livable to its users. According to El-Fiomy, this environmentally responsible model is a crucial step towards the socialization of students. It is a model of social life that that fosters talking, initiating contact, and various social skills that cannot be acquired only from one’s family. In the final day of the workshop, the participants finalized the overview boards, which functioned as a starting point for discussions with guest critics and the FA team. 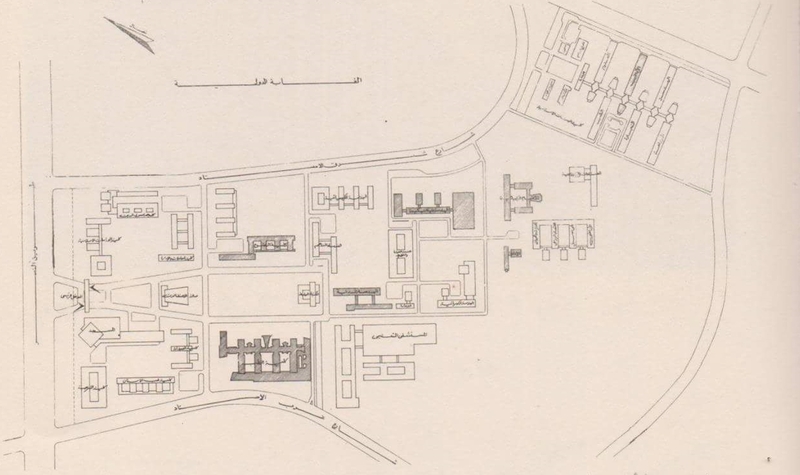 The results from the history group showed that the Nasr City campus, for political and ideological reasons, has never been totally free of interference from the state, from early Fatimid leaders providing stipends for researchers to Mohamed Ali ordering the establishment of secular departments within Al-Azhar in the early 19th century. Similarly, in 1962, Gamal Abdel-Nasser allocated approximately 300 Feddans in his new administrative capital, Nasr City, to build a new campus for Al-Azhar University with a more secular identity. Since then, Al-Azhar became a full-fledged university with a wide range of non-religious faculties, such as those of engineering, medicine, and commerce, with key positions being chosen by Abdel-Nasser himself. During the presidency of Anwar Al Sadat in the 1970s, the government moved to the so-called infitah (open-door) policy, in which the president opened up to religious movements that had been quelled by Abdel-Nasser. 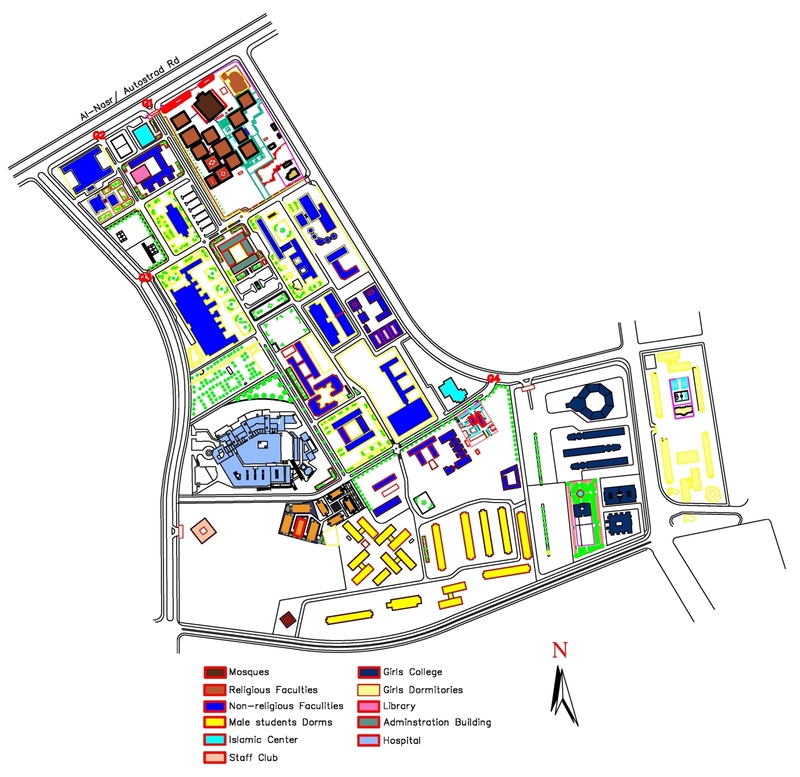 As a result, the original master plan of the campus was altered to allow for less Modernist and more ‘islamic’ building shapes and with religious centers such as Al- Saleh Kamel conference hall. In 1981 fundamentalists assassinated Sadat around the corner from Nasr City campus. Later, under the presidency of Hosni Mubarak (1981-2011), initiatives to fight religious extremists by reducing focus on religion have been encouraged. Islamic faculties were moved from the old campus in historic Cairo to the modern one in Nasr City. They were all placed at the far north eastern part of the campus, where they could be easier controlled. Participants from the architecture group stated that the girls’ faculty of Engineering, which is located inside male students’ campus and formerly attributed to the Department of Mechanical engineering for boys, has recently been walled, creating a deserted front yard and a backyard with one gate, to separate female students from the male staff. In addition, classrooms are usually overcrowded and poorly ventilated. Furthermore, girls repeatedly complained that they are alienated, marginalised and not permitted to pass through the staff gate, which links the faculty building with the campus administration. Likewise, the public space group depicted Egyptian cinematic characteristics to describe every outdoor space. Description spectrum went from naïve, boring, superficial, unwelcoming, neglected, mysterious, dependent, incomplete, thuggish, clear, quiet and formal to inclusive, intimate, open-minded and flourishing. In conclusion, the campus landscape was commonly fragmented, abandoned and underutilized to discourage social interaction. According to participants, the new university was more like an open-plan jail with aborted modernist ideals and curbed freedom. Similarly, other groups concluded that the campus forms a one large gated urban block torn by island-like walled buildings. Separation barriers are militarized, gendered and segregating. As an example of this, the university wall isolates students from the public urban life, and the administration walls segregate students from the chair building and key employees. Finally, the wall around the girls’ faculty of Engineering prevents gender mixing and the arcade fences isolate Egyptian students from foreign students. It can also be concluded that Nasr City campus is poorly impeded in Cairo and segregated at a neighborhood level by super blocks, most of which are for military uses. Furthermore, the campus’ main entrance is located on the highway of Al-Nasr Road, which works as an unpleasant or even dangerous location for students. Most strikingly, all universities in Cairo are linked with metro stations except Al-Azhar, which is strangely dropped from the newly constructed metro line 3 linking Nasr City with Cairo. To reintegrate the campus with its surroundings, participants proposed during the discussions to pedestrianise some parts of bordering highways through constructing two tunnels northward and southward of the campus. This seems to provide safe crossing points for employees and students. Another step was to change the campus into a common ground that hosts both the outside and inside community through removing the outward facing walls. This action will also turn the campus from a large super block into a series of walkable and permeable fine-grained/short urban blocks. Lastly, participants suggested a number of bike lanes within the campus to increase integration and cohesion between its parts. Altogether, political and social studies of Al-Azhar reflect developments with regard to religion and the authorities over time. 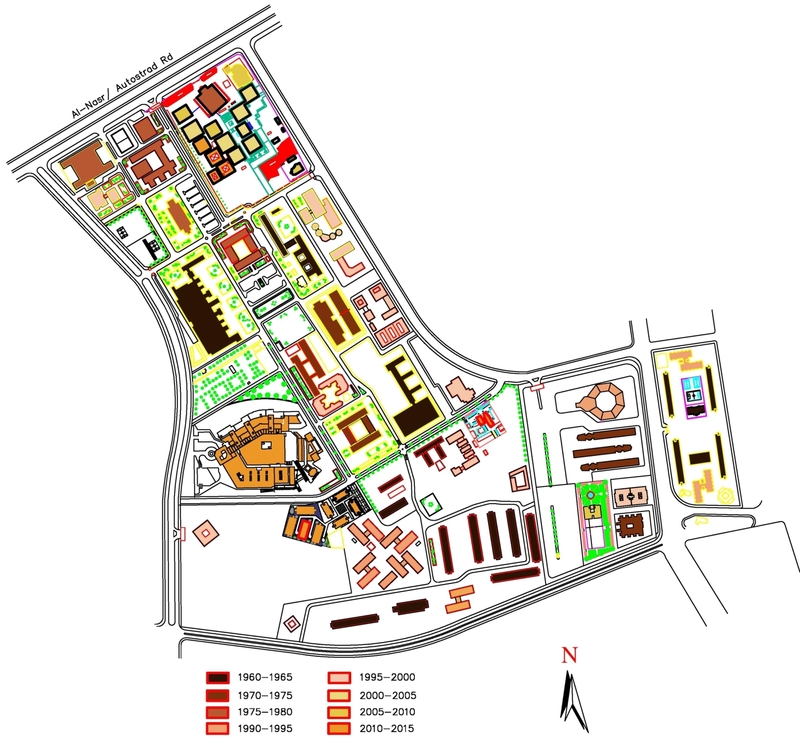 Part of the problematic aspects arises from the attempts of the authorities to put Al-Azhar under state control, while at the same time social segregation and the distorted public life at the Nasr City campus can in no small measure be attributed to the urban composition of campus itself and the surroundings. Seemingly, the campus is transformed over time to specifically segregate rather than modernise. It can be argued that instead of turning its back to Al-Azhar and religious authorities in general, the state should foster strategies that integrate them with the larger community. Plus, by removing the physical barriers, especially between the genders, an atmosphere students will be created that would allow students to get their voices heard, which will be beneficial for the educational process.